In April 2013, the International Services Office at Mayo Clinic received a copy of an article from a Gambian newspaper. In the article, a father begged for help for his 2-year-old daughter, Aisha. She was born with a ventricular septal defect – a hole in the heart that occurs in the wall that separates the heart’s lower chambers. Large ventricular septal defect require surgery to prevent complications. Aisha needed a heart surgery that no hospitals in her home country could perform, and the family was unable to raise the funds for her to travel elsewhere for care. Eventually, her uncle reached out to Mayo Clinic for help. Frank Cetta Jr., M.D., a Mayo Clinic pediatric cardiologist, reviewed the case and gladly accepted it. Then the International Appointment Office went to work to find a Mayo-sponsored charity that would fund her care. Cindy Kendall of the International Office called Kate Welp, a nurse in Cardiovascular Surgery, who also founded the nonprofit Hands for Humanity. 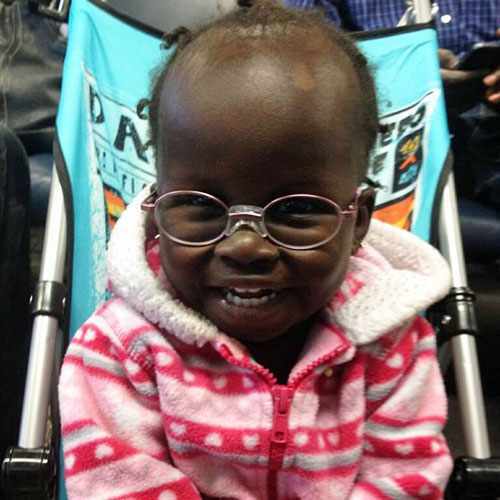 Without hesitation, Welp agreed to sponsor Aisha and her family. Hands for Humanity raised the funds to bring Aisha and her family from Gambia to Rochester. They departed on Jan. 17. On Jan. 23, Joseph Dearani, M.D., a cardiovascular and transplant surgeon at Mayo Clinic, performed a successful surgery in consultation with Allison Cabalka, M.D., Pediatric and Adolescent Medicine, and Eric Towe, M.D., Pediatric Cardiology. The surgery went well. With her repaired heart pumping strong, Aisha had hope for a healthier future. “Aisha's cardiac defect had caused significant failure to thrive, so she was very small,” says Dr. Cabalka. “Even with that, her development was entirely normal, and she was quite delightful and engaging. She smiled nonstop." While Aisha was recovering in intensive care, her father mentioned his concern for her vision in one eye. Del Wibben, Aisha’s cardiovascular surgery intensive care nurse at the time, talked with Aisha’s cardiologist. Soon, Aisha had an appointment with Brian Mohney, M.D., a Mayo ophthalmologist. Aisha soon donned a new pair of glasses and had a whole new way of looking at the world. You have made a difference … there are still angels amongst us. And, you all are certainly angels. Learn more about ventricular septal defect. Explore Mayo's departments of Pediatric Cardiology and Cardiac Surgery. Learn more about the International Services Office.